Sen. Mitch McConnell called Tuesday a "very good day," after Republicans managed to hold on to and expand their majority in the Senate, despite losing control of the House to Democrats. 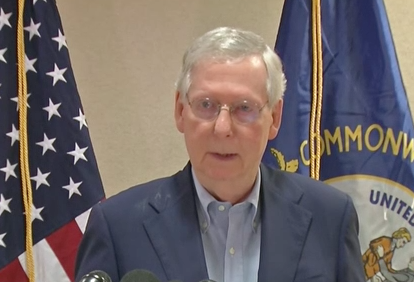 "It is indeed a good morning for Senate Republicans," McConnell told reporters at the Capitol Wednesday morning. "This is probably a rare opportunity to see McConnell smile." Praising the role of President Trump in the midterm elections and vowing to work productively with Democratic House leader Nancy Pelosi, McConnell said he envisions a legislative agenda that supports the president's immigration goals. "We're certainly gonna try to help the president achieve what he'd like to do with regard to the wall and border security." But McConnell was vague on the topic of taxes and whether Congress can implement the 10 percent middle class tax cut that the president promised in the weeks before the election. "Any effort on the tax side would clearly have to be negotiated now on a bipartisan basis. We'd have to do it together. We wouldn't have the possibility of doing it on a party-line basis." And now, McConnell said he does not see a path to repealing the Affordable Care Act now that Democrats control the House. "The Democratic House is not going to be interested in that," he said. More broadly, he warned the Democratic-led House against focusing on investigating President Trump. "The Democrats in the House will have to decide just how much presidential harassment they think is good strategy," he said. "I'm not so sure it will work for them." McConnell said he spoke with Pelosi Tuesday night to discuss "how to find a way forward." "We're not unfamiliar with each other and we'll probably have a lot more dealings with each other in the future," he added. Assessing the role of Mr. Trump in the midterm elections, McConnell said his campaigning was "extremely helpful....He worked very hard, drew large crowds, and I think it clearly had a positive impact on the outcome." He also took note of an apparent "Kavanaugh effect" in the races, referring to the political impact of Justice Brett Kavanaugh's contentious confirmation process in rallying the base. "Very helpful. I think the Republicans -- sort of core voters -- in the states that were critical of us were highly offended by the questioning of the presumption of innocence and the tactics." McConnell also said that for the remainder of the current legislative session he hopes to finish work on funding of the government. Asked if he sees a government shutdown, McConnell said "hopefully we will not be headed down that path." The president has threatened to shut down the government if Congress does not fund the southern border wall he wants. Funding for the department that oversees border security, DHS, expires Dec. 8.